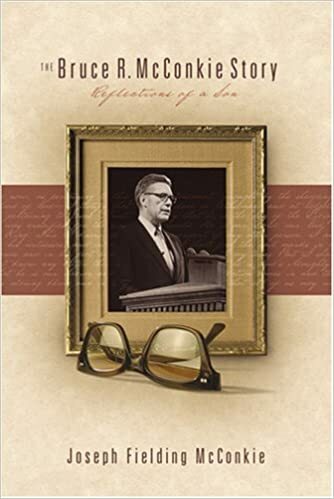 “I have been asked what my motivation was in my writing The Bruce R. McConkie Story: Reflections of a Son. “The answer rests as much in things I do not understand as it does in things that I do. It has been almost 20 years since Sheri Dew of Deseret Book invited me to write such a book. The feeling that I should do so simply was not there at that time. Perhaps this was a matter of my not being ready. I do not know. “It was about three years ago [from 2003 back to 2000, about the same time that my McConkie biography hit store shelves] that the feeling came that I should see what I could do with the topic though the idea intimidated me. The project presented a number of special challenges. I note two, first, the story was too good to tell. That is it was simply too personal or sacred in some instances to make public. “Secondly, the story was too bad to tell. That is because Bruce McConkie chose to stand for something he had a lot of critics even within the Church. Their actions were often sufficiently petty that they did not deserve a place in print. They simply did not engender faith and I knew that my father would want no part in telling such stories. “Suffice it to say there were a number of other difficulties peculiar to this work. My concern manifested itself last September when it was discovered that I had a tumor in my colon the description of which was a perfect match to the one that my father had. I asked my doctor what I could have done differently. He said, nothing, this is a case where heredity trumps. “One of the surgeons involved in the operation told me that while I was under the influence of the anesthetic I repeatedly pled for ‘help with the manuscript!’ The other surgeon assured me that a miracle took place that day and that I was not alone in the operating room. It was immediately after that experience that the obstacles in my path were removed and we were able to move forward with publication. During this period I had the opportunity to learn some of the great lessons that my father had learned as it became my turn to battle cancer. “You do not search and learn about a man like Bruce McConkie and have the kind of experiences that I had and not learn something. “I am asked what the most meaningful things I learned about my father were. I am not sure I know the answer to that question. One of the important things I learned was that when you get into a story like this the story gets into you and you will never be the same. “I knew how concerned my father was over the welfare of each of his children, I had not known the sense of reverence he had for his forebears. “I knew of the profound respect he had for those who presided over him, what I had not known was the sense of respect he had for those who labored under his direction. I will note, however, that it was much easier to labor under his direction as a priesthood leader than it was to work under his direction in the yard. “With his children, one of Dad’s favorite sayings (which came from his mother) was ‘live above it.’ When something happened that in your judgment was unfair, living ‘above it’ hardly seemed like the best solution. When as an adult I learned how frequently he was called on to practice what he preached, I began to see a lot of things quite differently…. “I have been told that when he [Bruce R. McConkie] met with the First Presidency [to discuss the book Mormon Doctrine], my father was invited to be seated but chose to remain standing. I also know that it was his practice (because he told me I was to do the same) when you are getting scolded, you offer no excuses—you just take it” (The Bruce R. McConkie Story, 185). Careful readers and scholars will find limited citations (for its size) in Joseph’s book about Bruce, and that is because, as he said himself, there is no library or archive that contains much of the quoted and paraphrased source material. He drew on Bruce’s private papers for significant portions. Readers of the book should be aware that there are certain groups of pages where Joseph quotes (or almost quotes) his father at some length but does not include quotation marks to so designate. Rather than complain I have felt to be grateful for the material. As of this writing, over 31 years have elapsed since Elder McConkie passed away. He is rapidly being forgotten. Joseph himself had to admit: “To the rising generation he may be only a name they hear appended to a quotation in a talk or lesson. But to many of their parents, he is a man held in particular love and esteem.” And this forgetting is more apparent today than when he wrote that over 13 years ago. Let us hope that these books about his life, and those he wrote himself to teach the gospel, will keep his memory and legacy and doctrinal understanding alive for those with enough sense to value them as the surpassing treasures they are.